I am not sure how to feel about the fact that Google has somewhat accurately pegged me as a cartoon character who dreams of desserts while desperately looking for Internet strangers with whom to belatedly freak out over The Bachelor finale. I do know that I spend a lot of time looking at photos of chocolate chip cookies on Instagram. So, I made the two Internet-famous cookies. 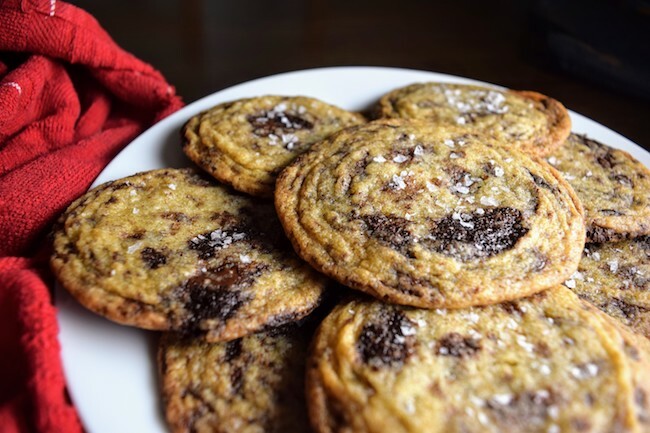 First up, the pan banging cookies from The Vanilla Bean Blog. I’d admired these pretty rippled cookies for possibly years before finally making them… I’m pretty loyal to the brown butter choc chip cookies and also really like the ones from Seven Spoons. But the pretty ripples and promises of crinkly, crisp edges and a soft, chewy center lured me in. I found these slightly too sweet for my taste, in the end, and not as soft in the middle as I’d hoped. I’ll note that I did not make them as big as in the recipe (1/3 cup of cookie dough each! ), which I think greatly contributed to my texture woes. But they sure are photogenic! I brought them to a high school classroom where I volunteer, and they were completely inhaled, so my tastes may be in the minority. Using an electric mixer, beat the butter until fluffy. Add in the sugars and beat until fluffy again. Add the egg and vanilla, mixing on low until combined. Mix together the flour, baking soda, and salt, and add it to the butter mixture, mixing by hand until just short of combined. Add the chocolate pieces and finish mixing until just combined. Scoop large cookies, leaving a lot of room in between for spreading. With cookies that were about 2 Tablespoons, I could fit ~6 on a baking sheet. The recipe suggests 1/3 cup of cookie dough; I imagine even 4 cookies would be stretching it, then. 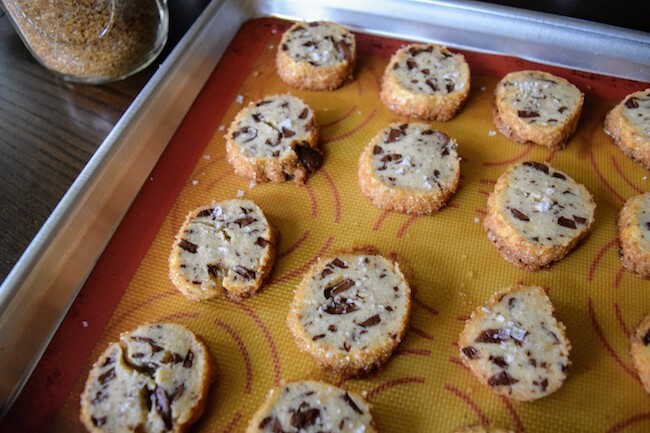 Chill the baking sheet – with cookie dough – in freezer for 15 minutes. While the first baking sheet is chilling, prepare the second sheet. Once the first baking sheet is done chilling, place in the preheated oven. 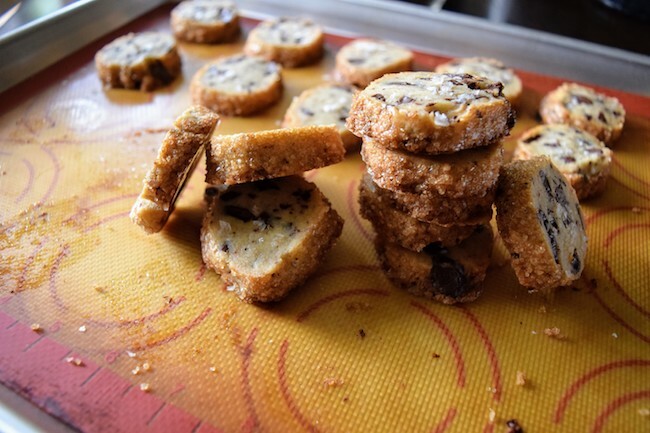 Wait 8-10 minutes – until the center of the cookies are puffy, but the edges are set. Lift the baking sheet a few inches off the rack and let it fall (pan bang), until the centers fall down. Repeat this every 2 minutes or so, as soon as the centers puff up. Remove when the cookies have baked a total of 13-16 minutes, when the insides are still quite soft. The cookies will finish baking on the sheet. I couldn’t resist sprinkling these with a little salt. You can continue, switching out pans and preparing one pan during the other’s 8-10 minute first bake, until the dough is done. Of course, I couldn’t resist finishing with a little salt. The next cookies, salted chocolate chunk shortbread cookies from Alison Roman’s Dining In, I knew I had to make the moment I saw them. Shortbread? With salt sprinkled on top? And rolled in turbinado sugar? I knew I’d be obsessed with this cookie. I just had to wait until I was sure I could bring most of the recipe to work or an event to avoid eating 2+ sticks of butter. These cookies didn’t disappoint, for me. They’re dense and extremely buttery, and the salt and sugar make them crunchy as well as crispy. I don’t think these replace my preferred classic choc chip cookie recipes, but they are amazing. I think of them as more similar to Dorie Greenspan’s world peace cookies. Using an electric mixer, beat the butter, both sugars, and vanilla until light and fluffy. Add the flour and chocolate chunks and mix on slow (or by hand) until combined. You may need to use your hands to knead the dough to coax it into combining. Don’t worry if it’s a little crumbly! The cookies are forgiving, and they’ll firm up a bit in the fridge. Divide the dough in half, dumping each half onto a large piece of plastic wrap. Roll half the dough into a long log, using the plastic wrap to guide. I made my cookies pretty small, so my log was about 10 inches long, and the cookies were 1 to 1-1/2 inches in diameter. Repeat with the other half of the dough. When ready to bake, preheat the oven for 350˚F. Brush the outside of the dough with the beaten egg. Roll the log into the turbinado sugar. Using a serrated knife or very sharp chef’s knife, carefully cut the log into 1/2 inch slices. 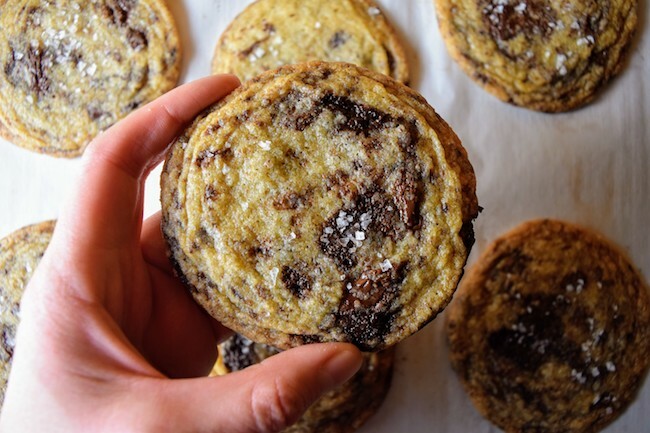 You may need to wiggle or gently saw if you hit a chocolate chunk (or simply re-assemble a cracked cookie). Place them on parchment or silicon-lined baking sheets with 1 inch between (they don’t spread very much at all). Sprinkle with flaky salt, and bake for 12 minutes or so, until the edges are barely browned. Let the cookies cool before eating; they really are better cooled!